Our Son, The Energizer Bunny. You are here: Home / Parenting / Our Son, The Energizer Bunny. After another jam packed day of treadmill training, seeing a therapy dog, playing with toys, and drinking lots of ice cold milk (on his own!) you’d think our little man would be ready for a good night’s sleep. Not by a long shot. 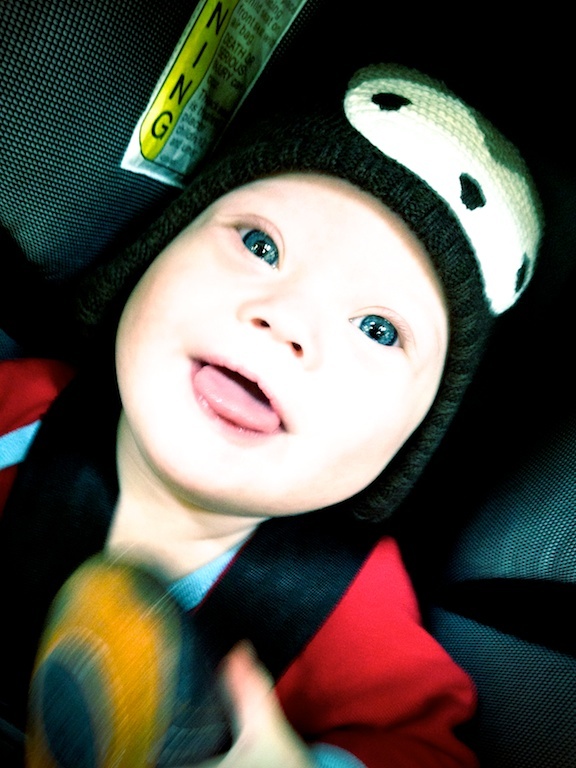 As you can see in today’s video, our little boy is sort of like the Energizer Bunny. He keeps going, and going, and going….and going! An hour or so after lying him down I went in to check on him, expecting him to be sleeping like a baby, but boy was I wrong. Instead of sleeping, he decided bedtime would be a great time to work on his core muscles. So there he was trying to pull himself up on his crib. It’s so cute watching him try so hard. This little boy is so tough, and I couldn’t be more proud to be his daddy. I love this kid! But it’s all good, I don’t mind at all. I love how he is so into exploring his environment and solving problems on his own. 1. All smiles and ready for the day. He's all smiles, and ready for the day! 2. Working hard on the treadmill. This little boy seriously rocks the treadmill. It’s so much fun to see how far he has come since he frist started. 3. 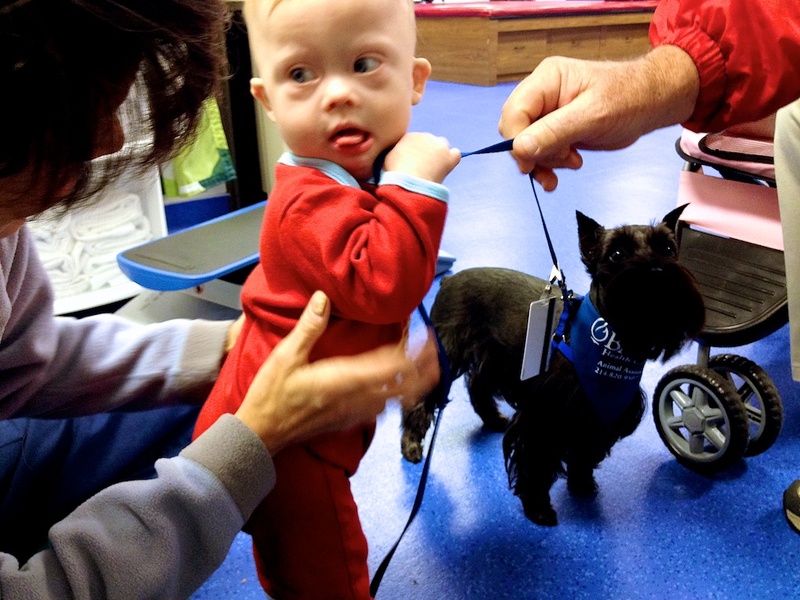 Not entirely sure about the physical therapy dog. He doesn't quite know what to think of the therapy dog. 4. Holding his own bottle! As we mentioned the other day, we tried lots of bottles before finding the one that worked best. But what’s funny is Noah really likes to use these little “cheapy” bottles as opposed to some of the more expensive bottles. We don’t mind because they are a.) cheaper and b.) we get to watch him hold his own bottle. And man, oh man, it’s cute! Time for some ice cold milk. 5. Work hard. Play harder! 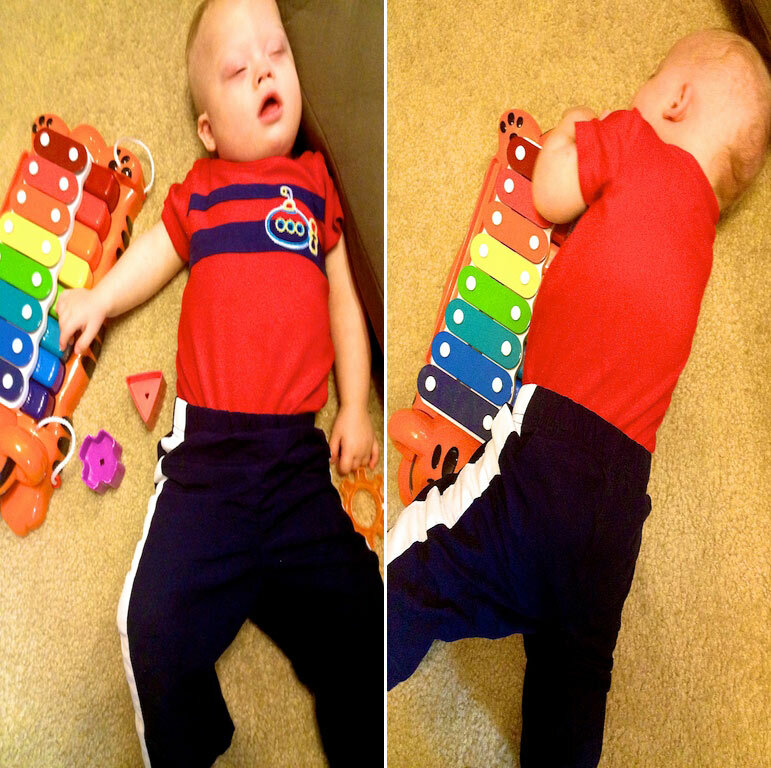 There I was playing in the floor with our son, laughing and having a good time, and then all of a sudden….HE’S OUT! Yelp, out like a light…or so I thought. He's all played out for the day...but not for long. 6. 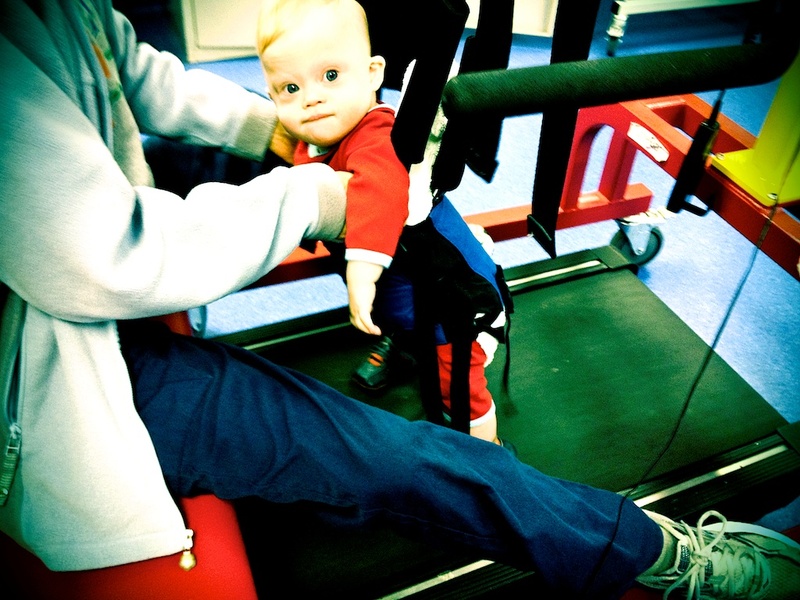 Working out at the gym…in his crib! This kid works (and plays) hard! And I’ll say it one more time, I love every second of being this little boy’s dad! How about your child? Do you have a baby Energizer Bunny on our hands, or he/she more laid back? What’s the funniest / cutest thing you’ve ever caught your baby trying to do in their crib? Take a second to leave a comment below and tell us about it. 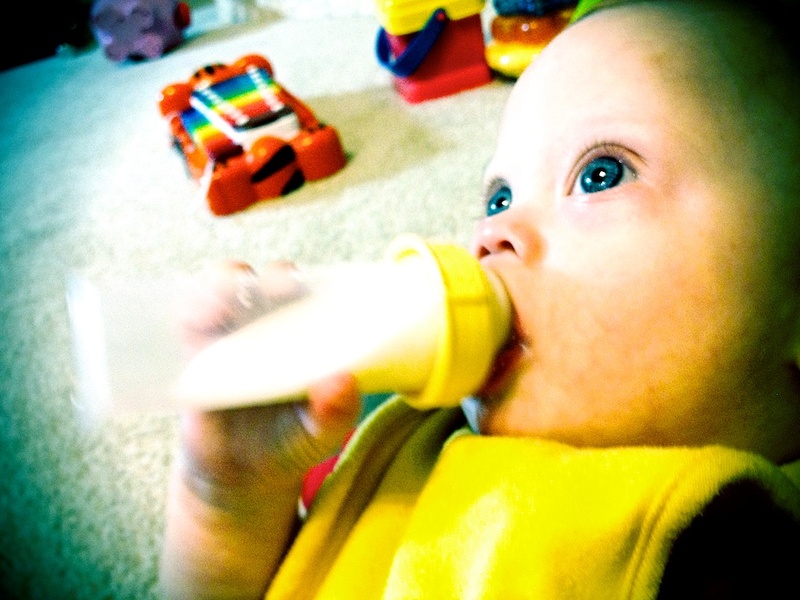 Rick, I am a mother of a 9.5 months baby Felipe who was diagnosted DS when he was born. Your posts have been a total inspiration for me. I can not thank you enough. I love to see Noah. I feel so happy about the milestones he reaches and how much fun he gets working as hard as he does that I almost cry ( sometimes I do) when I see what he is doing. Today Felipe started his first moves towards creeping ( not crawling yet) and I thought about Noah, of course, before I cried like a baby tears of joy. I am so proud to belong to this wonderful DS family. I have started our own blog, if you can check it http://www.elfelipedemama.com. is in spanish though as we are costarricans. Tons of blessing and is wonderful how God is using you, your beautiful wife and awesome Noah to give joy, educate, inspire and encourage so many people. I really enjoy following your blog! We are expecting a daughter with Down syndrome in a few weeks. Although she is my seventh child, I have never used a crib but think I may need one for her. What type of crib did you get? Would you recommend it? Are there certain features I should look for that are good for babies with a little extra 21? I can’t believe how many different cribs there are out there! Thanks for all the great info on your blog. I know I will refer to it often after she is born.